I. DESCRIPTION: A silver and enamel badge 7/16 inch in height and 3 inches in width, consisting of an Infantry musket on a light blue bar with a silver border. II. 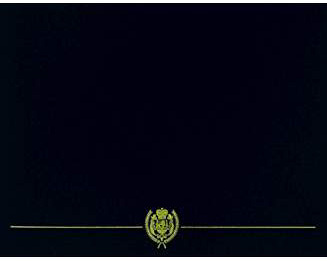 SYMBOLISM: The bar is blue, the color associated with the Infantry branch. The musket is adapted from the Infantry insignia of branch and represents the first official U.S. shoulder arm, 1795 model Springfield Arsenal musket. It was adopted as the official Infantry branch insignia in 1924. III. AWARD ELIGIBILITY: Personnel must meet Department of the Army established testing requirements and must possess a military occupational specialty within Career Management Field 11 (Infantry) or 18 (Special Forces), less MOS 18D. IV. 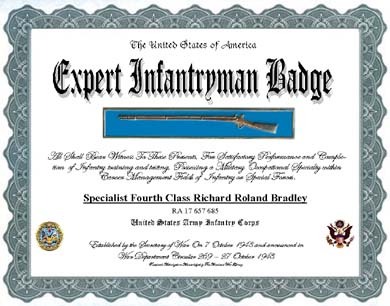 DATE APPROVED: The Expert Infantryman Badge was approved by the Secretary of War on 7 October 1943 and announced in War Department Circular 269 dated 27 October 1943. V. SUBDUED BADGE: The subdued badge is authorized in metal and cloth. The metal badge has a black finish. The cloth badge has an olive green base cloth with the rifle and border of the bar embroidered in black. VI. MINIATURE BADGE: A miniature badge, 1 3/4 inches in length and 3/8 inch in height, is authorized in lieu of the regular size badge. A dress miniature badge, 1 1/4 inches in length and 3/16 inch in height, is also authorized. Award Eligibility: Personnel must meet Department of the Army established testing requirements and must possess a military occupational specialty within Career Management Field 11 (Infantry) or 18 (Special Forces), less MOS 18D. Infantry Lieutenants assigned to 2-11 IN (IOBC) will not test for the EIB. Infantry Lieutenants test best at their first assignment with members from their Infantry platoon. They are expected to inspire and motivate those around them by their example. This shared sacrifice during EIB training and testing ensures new platoon leaders understand unit and Division standards and shows the platoon what their platoon leader is made of. During EIB training and testing, the platoon leader's example inspires others to excel and it gives the platoon leader first hand knowledge of Division specific testing procedures thus allowing him to better prepare his platoon in subsequent years.